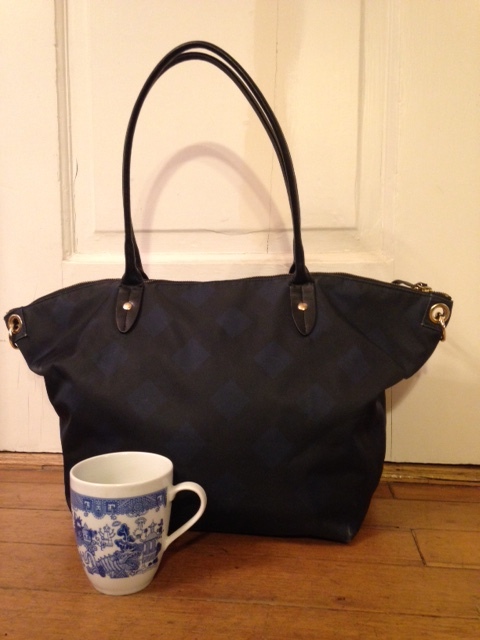 My traveling tote, sitting at the front door, with a mug of coffee to show size. Many readers of mystery/action novels will be familiar with the series that Lee Child writes featuring Jack Reacher, a former Army MP who drifts across the country finding trouble and fixing problems. Reacher has no home and no possessions. He travels with no baggage. He carries only his debit card and his toothbrush. Every three days he goes into a cheap clothing store and buys a new outfit, skin out, and throws away the old set. I find this character’s travel habits very compelling. I myself travel as lightly as possible. I have not checked any baggage for airline flights in decades. I don’t pack for marginal clothing contingencies that expand my luggage requirements. I figure that if I need something, or I forgot something, there are stores everywhere. Go native, that’s my motto. For the holidays, I went to Wisconsin for two weeks, visiting family and friends in two cities. I wondered if I could do it with no baggage at all, just like Reacher. I decided to make it a challenge. Could I, in fact, travel with no luggage whatsoever? The short answer is…well, wait and see. My rules: I would take no clothing at all and buy a new set every two days (I like to be fresher than Reacher evidently does). I would take my “toothbrush.” (I took most of my toiletries, including my toothbrush and my brand of floss, plus all my contact lens solutions. Evidently Reacher doesn’t wear corrective eyewear of any kind.) I would take at least one change of underwear, because I would arrive at night, the stores wouldn’t be open, and hey, I like to be fresh in the morning, what can I say. But my outerwear, toiletries bag, and change of underwear had to be carried somehow, so I stuck everything into my navy tote bag. My purse (and laptop! Very un-Reacher) fit in there, too. Already I’m carrying more than Reacher, but Reacher’s a guy, after all. Plus, fictional. There’s a great St. Vincent de Paul store in my home town, my first stop, so I went there the afternoon after my arrival. By then I’d realized the problems of the Reacher Packing System if applied during the holidays. Stores would be closed on Christmas and New Year’s, maybe even Dec. 24 and 31. I wouldn’t necessarily be able to acquire a new outfit every two days. I decided that I’d buy as many of my outfits as I could all at once. And then, modeling Reacher’s behavior, I’d wear one for two days and then toss (read: redonate) it after I’d worn it the designated time. Doing laundry would also work in a pinch, although that solution did not model Reacher’s behavior. I haven’t read all the Reacher novels, but I’ve never seen him do laundry. It doesn’t seem in character. I struck gold at St. Vinnie’s. I got one cotton sweater, seven shirts (one for a PJ top), one pair of flannel pants (for PJ bottoms), two pairs of jeans that fit perfectly, and seven pairs of really nice, dark, heavy, cotton-wool socks, all for $21. I figured jeans you can wear forever without washing, and the rest: two days of wear for each item would carry me for two weeks. The tossing/redonating did not go as expected. People did laundry, and I threw things in. The tee-shirt/flannel pants PJ items got washed a couple of times, as did the socks and the magenta top, my favorite. I didn’t like one of the shirts after I bought it, and the sweater wasn’t nearly warm enough, so I redonated those two things the next day. (I’d worn a fleece top on the plane and wore that as my second layer for the entire two weeks.) One top was slightly dressier than the others, and I saved that and wore it only for get-togethers. At the end of the two weeks, I had Christmas gifts I had to ship back (note to relatives: either no gifts or ear rings only, please! ), and I included in the packing box the dressier top, the magenta top, the jeans, and the socks. Everything else I redonated on my last day. Strictly speaking, going Jack Reacher—i.e., traveling with no baggage—doesn’t work for me. I needed a tote for my toiletries, cold-weather gear, and the change of underwear. The summer might have different requirements: for example, I would probably want to carry my own bathing suit rather than trust I could find one at St. Vinnie’s. And then there’s always my purse and sometimes my laptop. Carrying only the bare necessities is liberating. Thrift stores are plentiful—at least, in the places I visit. If you’re not too fussy about what you wear, you can be clothed for less than it costs to check a bag with an airline. I like to wear natural fiber clothing (cotton, linen, wool), and I didn’t have any trouble finding items that fit my preferences. If I were traveling abroad, I’m not sure what my luck would be. I overbought. I didn’t need to buy two pairs of jeans, but they fit so well and showed so little wear and were so cheap, I couldn’t pass them up. I also didn’t need six shirts. All the people I visited do laundry often, and it’s easy to toss in a shirt or pair of socks here and there. It’s not what Jack Reacher does, but it might be what I do. I had fun. One of the St. Vinnie’s volunteers got into the Jack Reacher story and offered to become my personal shopper. There’s a remarkable energy when you need to buy a bunch of stuff and the prices are so negligible that you don’t fear making purchasing mistakes. You can throw financial caution to the winds, and the items are so eclectic that if you’re in the mood, you can change your usual fashion style with virtually no risk. So would I do it again? Heck, yeah. I’m thinking about summer. Just call me Joan. Joan Reacher. This entry was posted in Writing Life and tagged Jack Reacher, Kay Keppler. Bookmark the permalink. I LOVE this. When my daughter was in seventh or eighth grade, one of her friends came to spend the weekend with only what she stood up in and a toothbrush. She’s been my “Jack Reacher” model ever since. What fun! Maybe that kid was the model for Lee Child’s Jack Reacher, who knows? Pretty brave of a middle-schooler to travel with nothing, too. I love this, too–most of all because you had fun, and huge kudos to your SVP volunteer personal shopper! I don’t think I’d ever try it, because I resent time spent clothes shopping even more than I hate waiting at baggage reclaim. I could manage a long business trip with just a small carry-on bag, though. And I once went to Russia for a week (Monday-Friday) with a Reacher-esque colleague who had all his notes on his phone, clean underwear and socks in his coat pockets, and no bags whatsoever. I love these stories! The socks and underwear in the pockets—this would totally work in Wisconsin in the winter. Wish I’d thought of it! I need to keep this sort of thing in mind even for historicals. My main character Susannah doesn’t really have anything to pack. She’s got two dresses…that’s it. Whereas Nate’s sisters have a multitude of clothes. I’m sure Susannah could shove everything in a bandbox. Weren’t those dresses pretty bulky? Although I guess it depends on your time period—muslins from 1812 would be a lot easier to pack than those bustles from 1865. Good luck squishing everything into the bandbox! With two kids, I tend to over pack, but I will say that I was proud of our two week trip to Italy this past summer. I had one carry-on for each adult, and the kids split one. We stayed in Airbnb apartments and just did lots of laundry, which didn’t bother me at all. When we went to my family’s house for Christmas this year, we got everyone’s stuff into one medium-sized suitcase. Naturally, we did laundry. I have to say, though, I’m with Jilly on the shopping. HATE IT. Unless, of course, I’m buying a handmade wool sweater in Rye! Well, I hate clothes shopping, too, if I have to go to a department store. The flashing lights, the scents, the millions of “boutiques,” and ARGH, the MUSIC. But the St. Vinnie’s experience—there’s one rack, and the biggest question is, does it fit? I was in and out in an hour, and that was seven outfits. I defy anyone to choose seven outfits from Macy’s or Nordstrom’s in an hour. But it sounds like you have the packing lightly thing under control! That always does seem to simplify travel. What a great project! I definitely try to pack lightly when I travel, but not quite that light. I do have a strange desire to head over to the local thrift store and see what kinds of outfits I can find though. The best packing advice I ever got was that no matter how long the trip, you don’t really need to pack for more than a week (since you can wash things). That’s meant I’ve had no trouble packing in a carry-on for my 3-week trips to Oxford. I agree! A week’s worth of stuff is all you need. Even if you have to hand-wash in the sink as a backup, it’s still worth it. LOL, this is great! A true traveller’s fantasy: ditch the luggage and enjoy the trip! As for me, I’ve got serious hoarding qualities, and I get anxious without my laptop nearby, even for short trips to town. Plus, I need a CPAP machine. So, in theory, I could get by with a large purse that would hold my laptop and a roller-bag. Give me a roll of quarters, and I can book exclusively at hotels and homes with washing machines. (-:And, I’ll buy a ukulele at my destination. I’m going to have to check out the thrift store option when I travel. In my college town, the thrift stores were all downtown — far from the airport and I needed a car to get to them. But after hearing about your success, it sounds like a taxi ride would be a good idea! (-: When I return home for a visit, I often take advantage of the time to stock up on clothing — I often won’t buy very much the year before, and then about two weeks before I go home, I go online and order a bunch of work clothes, underwear and two pairs of jeans, and have them delivered to my mother’s house. It sure beats spending a day and a half in the shopping mall. Somewhere, maybe on Fodor’s website, I read a story about a woman who saves up her old underwear and bras for trips. When she takes off her tattered undies, she just tosses them in the trash, and then comes home to a drawer full of brand new lingerie. I’ve always been fascinated by that story; I just can’t come up with a compelling character who does that . . . . Oh well, 2018 is young! Maybe Jacquie Grabbour, international witch at large, needs to take a trip with a tall and handsome werewolf . . . . Shedding and shredding her underwear all along the way. Michaeline, I love that underwear story. The closest I came to something like that was when I recently went to Scotland. I had purchased new sneakers beforehand, but decided it wouldn’t be a good idea to do a lot of walking in new shoes, so I took my battered old pair instead and then tossed them at the end of the trip. This is impressive, Kay! And on some level, I am envious. I don’t think I could ever pull it off. In addition to the difficulty of buying clothes on location (I’m short so need SMALL stuff, and am allergic to anything that ever lived on an animal), I would have major anxiety about not having enough pairs of shoes (including high heels) and multiple sets of my own workout clothes. I also tend to pack my yoga mat, and if on a driving trip, I’ve been known to pack light weights. I’d prefer to take my whole closet with me if I could, so I wouldn’t have to decide ahead what I might want to wear for the next week or two. I think I’m the anti-Jack. Reacher travel. Reacher often has no debit card, so that was out. No toothbrush necessary, as all you need is a rag to disturb the plaque. No underwear, because underwear is not an essential. I begged in front of Savers, Salvation Army, St. V., and others when I needed a change of clothes. This only works if you’re a proficient beggar, but begging in front of thrift stores or even pawn shops is a hell of a lot easier than doing so in front of Bonwit. My problem came with Jack’s brawling side. He’s better at it than I have proved to be.